The NSW Government has awarded the $1.376 billion Sydney Metro City and Southwest line works package to a joint venture between CPB Contractors and UGL. 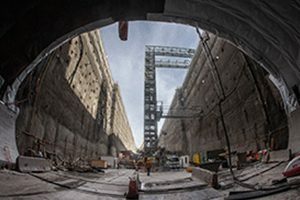 Works will include the design, construction and commissioning of major rail systems in the twin 15 kilometres Sydney Metro tunnels from Chatswood to Sydenham, the expansion of existing Sydney Metro Trains Facility at Rouse Hill and the delivery of a new facility at Marrickville. Tunnel ventilation, mechanical and electrical systems for seven underground stations and power stations for the Sydenham to Bankstown section is also included in the package of works. Works are expected to commence this year and are scheduled to conclude in 2024. CPB Contractors Managing Director Juan Santamaria said the project further builds on CPB Contractor’s portfolio of rail projects in Australia, including Sydney Metro Northwest and the Metro Tunnel in Melbourne. “We’re committed to leveraging our unrivalled experience on major projects to safely deliver this important infrastructure for the people of NSW,” Mr Santamaria said. CIMIC Group Chief Executive Officer Michael Wright said the new work at Sydney Metro aligns well with CIMIC Group’s offerings as a rail solutions provider. “The project combines the proven rail-sector expertise within our construction company CPB Contractors and our asset solutions provider UGL to deliver an end-to-end result, covering design, construction and commissioning of the project,” he said. UGL Managing Director Jason Spears said the works package will continue UGL’s relationship with Sydney Metro. “The involvement of our in-house operation and maintenance teams throughout the design and construct phases will optimise operational performance at the project,” Mr Spears said.